Global School of NDT training courses are accredited by the British Institute of NDT and approved for use as an Olympus Training Academy member. Global School of NDT Training courses have been developed with both the student and the employer in mind, focusing on the practical as well as the essential theoretical components of the method. Our course run a consecutive ten days and adding two days for examinations resulting in a total of 12 days – less than two weeks which return less lost billable time, less travel and accommodation costs and overall cost reductions. Our course locations are selected to bring the training closer to the student, less travel, less accommodation, resulting in an overall reduction in costs. Our courses include detailed course study materials which capture high quality colour graphics and detailed explanations, and are supported by video, overhead and ample hand-out materials. 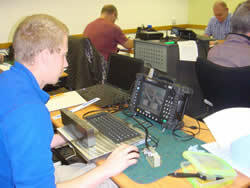 Global School of NDT also offers practical hands-on preparation for that 5 year resit. Preparation time for theory and practical exam aspects are available from early morning to late evening – seven days a week – just ask our staff for details.